2. Line a baking sheet with aluminum foil, and mist with cooking spray. 3. 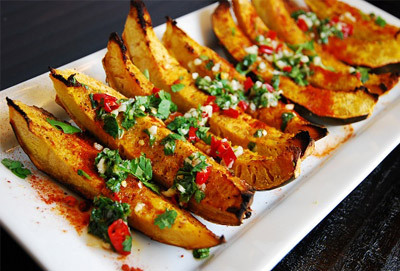 Arrange squash wedges on baking sheet, and then lightly mist with an olive oil mister, and sprinkle with ½ of the salt. 4. Roast squash in oven until tender, about 25- 30 minutes. 5. While squash is roasting, combine remaining ingredients in a small bowl. 6. Transfer squash to a platter, sprinkle with paprika, drizzle with the vinaigrette and serve.